Aren't they just Americans expressing their views collectively? No matter how high-minded the candidates attempt to be when entering upon election season, sooner or later the mudslinging begins. There's any number of possible accusations that may be flung back and forth, but one of the most common is that one's opponent is the captive of "special interests." The Special Interests moniker is always assumed to be bad; you never hear any candidate proudly proclaiming their close association with "special interests" -- at least, not in so many words. But if you stop and think about it, this is somewhat strange. What the heck is a "special interest," and why are they so bad? Usually, a special interest is applied in contrast to the general interest -- that is, the general welfare of the nation as a whole. So, it might be argued, the "general interest" of the country would have called for action X, but because of his captivity to special interests promoting Y instead, Senator Grumplesnort supported action Y. When looked at this way, it certainly sounds bad. But who decided that action X is, in fact, in the general interest of the country? Why, the people arguing for it, of course! No doubt the people arguing for action Y feel just as strongly that Y is the way to go. In a representative democracy, the whole point of the political process is to allow the grievances and desires of the voters to be aired. They may be the desires of the very poor; they may be the desires of the very wealthy. They may be something that applies to everyone; they may be an issue that affects only a few. A foundational principle of the First Amendment is that everyone has the right to free speech and "to petition the government for a redress of grievances." What's more, the First Amendment also guarantees "the right of the people peaceably to assemble." What is a special interest group, other than a group of people who are exercising their First Amendment rights of assembly? You may not agree with the cause for which they assemble; but if we are to be a free country, they have an absolute right to do so, and to petition the government for whatever it is that they wish. If a politician is listening to a "special interest group," and is doing what they request, does that mean that he's their "captive"? Or, rather, does it mean that he is performing his Constitutional duty of listening to the grievances of a group of his constituents and representing their interests? The existence of "special interests" is not a sign of cancer in the body politic; far from it, it is the very stuff that politics is made of. Other than a very few fundamental needs, like breathing, virtually every "interest" is by definition special, because not everyone cares about it or agrees with it. So why, then, are special interests so bad? By definition, they aren't. But special interest groups are a true area of concern - not because they have so much power, but because they even exist. Consider the purpose of a special interest group. There is some issue that a group of people finds compelling -- an issue about which they feel so strongly, that they are willing to donate their money and time. Occasionally, this results in a monstrous pile of money and time; the NRA, NARAL, MoveOn.org, and other such groups have tens of millions of dollars available to them, all given by people who felt so strongly about the issue that they mailed in their own hard-earned money. Supporting a special interest group is not a very efficient way to promote a cause. I frequently drive by a very large office building in Northern Virginia which belongs to the National Rifle Association. The parking lot is filled with lots of Mercedeses and Lexuses (and a few pickup trucks with gun racks). No doubt there are any number of computers, desks, telephones, and what-not inside the building, little of which directly affects gun ownership, but all of which must be paid for by donations of members. This is not to single out the NRA as being inefficient; it's not. But it's in the nature of a special interest group of whatever kind that a large amount of overhead is required just to run the place. In the early days of this country, there were a tremendous number of advocacy groups. The famous French writer Alexis de Tocqueville commented on them in his famous book, Democracy in America. Pretty much all of them were local groups, addressing matters of local concern. There wasn't anything like the national pressure organizations we see so many of today. Business trade groups, unions, social issues, foreign affairs -- we must have thousands of groups, each with their office in Washington, each with their staff small or great, all trying to bend the ear of the Powers That Be. Something is wrong here. The only reason for a person to contribute to a special interest group -- the only reason for the existence of such a group in the first place -- is because a group of people feels that their local concerns are being ignored, and will not be addressed via the local political process. The vast number of national special interest groups we see today are not the cause of a cancer in our body politic, but rather, the symptom. The real cause is that we have abandoned the principles of federalism, known more commonly today as the principle of subsidiarity. This principle is: all governance should be handled at the lowest possible level of government. What on earth does the Federal government have to do with education in your local elementary school? Why is it even any of their business? What does the President care about the goings-on in Shady Grove Elementary, and why should he? He can't even locate it on a map. In the New England town meeting form of government that was so influential on our Founding Fathers, almost all issues were handled at the local level by selectmen in the village that everyone knew. Schoolchildren not learning? A motion to sack the schoolmaster would be made at the town meeting and voted on. Roads bad? The subject would be debated, and the decision would be democratically made either to increase the tax levy and fix the roads, or save the money and live with them as they were. Either way, everyone knew who to go to with an issue and the problem could be resolved locally, in a locally suitable way. This led to government that was both responsive and efficient -- responsive, because the selectmen lived two roads over and you could harangue them in passing in the general store; and efficient, because the local voters knew that anything they wanted done, they'd have to pay for. Today, how many local towns handle their own education? Precious few. We have vast regional school districts covering multiple towns or counties with millions of dollars at their disposal. Why should they care what one parent thinks, or even a dozen? For all practical purposes, they answer to nobody. The voters aren't stupid; they know they're being ignored. But they cannot change anything, since in most states, a lot of the local school budget actually comes from the state which is even farther away and more removed from the locality. The same goes for roads, law enforcement, and countless other issues. The more removed and unresponsive a government becomes, even if it is democratically elected and supposedly representative, the less satisfactory it will be. The growth of special interest pressure groups is a response to this problem: "they won't listen to me, but maybe they will listen to a hundred people like me." Or a thousand. Or tens of thousands. Or millions? But then, the pressure group grows so large that it no longer cares what one person thinks, and the problem begins anew except now you have another large organization with its own bureaucracy and its own overhead trying to justify its existence. There are a great many special interest groups that at one time were founded on individual donations, but now get most of their money... from government grants. They no longer have to answer to individual voters at all; they've become just as removed as the government is. We can complain all we like about the power of "special interests," but the real problem is that the government is too large to care about anyone's interests but its own. A return to federalism and the principles of subsidiarity, so beloved of our Founders, is the only solution -- empower local governments to make all but the most major decisions, and otherwise leave them be. That way, every individual can easily live in a community that best reflects his own values, and is most responsive to his own needs. What could be more free, and more American, than that? And what if we don't get back to federalism and subsidiarity? 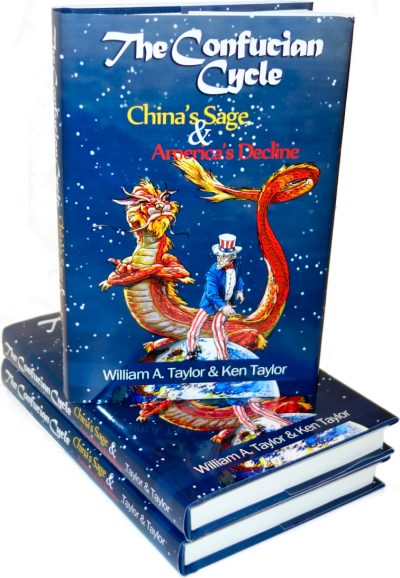 We'll all have window seats on a sleigh ride into the abyss of the Confucian Cycle. The Economist has observed the same phenomenon, though come to a somewhat different conclusion, in the context of England. I have now learned a lot by reading this article.